Usticke Family Blog» Blog Archive » Why is my name Usticke? Why is my name Usticke? Before my father passed away, he spent the last few years of his life researching our family history. I recently loaded his genealogy data into the family tree site itsourtree.com and have been expanding it with other branches of our family. Looking at my father’s research, it raises some interesting questions about the Usticke name (pronounced you-stick). Why is my name Usticke? Well, that’s easy. It’s because that’s my father’s name: Gordon William Usticke. So, let’s go back a bit further. Stephen Usticke Nowell-Usticke’s father was a Beauchant as was his grandfather (Theophile Beauchant) and great-grandfather (Samuel Beauchant). Why is my name Usticke and not Beauchant? Why did Stephen Usticke Nowell-Usticke take his mother’s middle name, and where did Nowell come from? Well, let’s look at his mother’s family. Stephen Usticke Nowell-Usticke was actually born Stephen Usticke Beauchant around 1818. His maternal grandmother, Anne Usticke, was the product of two English families: Nowell and Usticke (sometimes spelled Ustick and, going back to the 16th century and prior, spelled Ustwicke). Anne had six sisters but only two brothers, Stephen Usticke (circa 1752 – circa 1823) and Robert Michael Usticke (1771 – circa 1851). Apparently, neither brother had children. 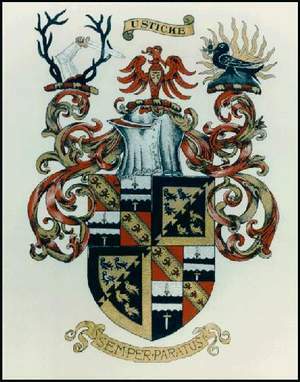 William Ustick and Philippa Nowell’s youngest son, Robert Michael Usticke, used both his parent’s surnames; and, when he died childless in 1851, left the names and his armorial bearings (coat of arms) to his sister’s grandson (his grandnephew). 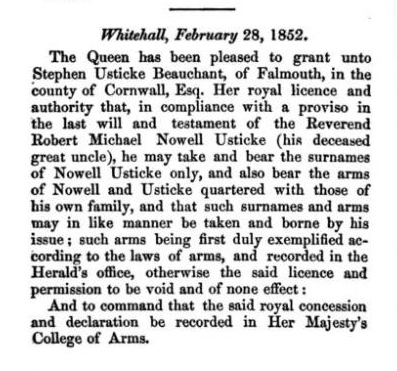 So, Stephen Usticke Beauchant became Stephen Usticke Nowell-Usticke. 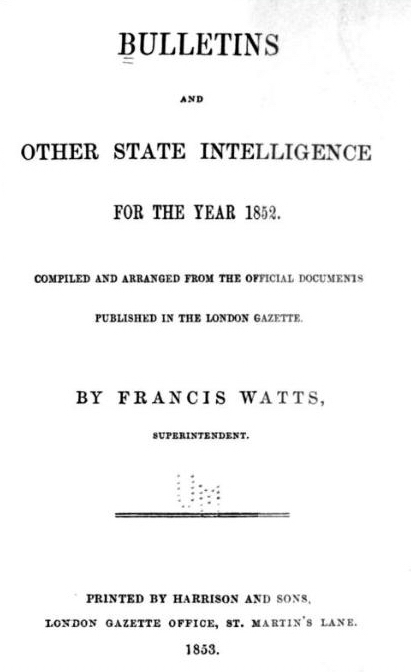 And here’s the evidence of that transaction from page 192 of the book Bulletins and Other State Intelligence for the Year 1852 by Francis Watts, published by Harrison and Sons, London, 1853. The Nowell-Usticke coat of arms is noteworthy, because it includes three crests, which results from the combinations of three families: Nowell (left: arm grasping a sword between antlers), Usticke (center: red demi-eagle) and Beauchant (right: green martlet holding in its beak an acorn in front of rays of the sun). So, why am I named Usticke? Because my great great grandfather inherited his name from his granduncle (my great great great great granduncle), and it’s come down father and son to me (minus a hyphenated Nowell). This entry was posted on Friday, June 6th, 2008 at 1:36 pm and is filed under Family. You can follow any responses to this entry through the RSS 2.0 feed. You can leave a response, or trackback from your own site. I like your family coat of arms. Hi my Aunt Alice Mary Munford (1879-1961) married a Capt Stephen Utsticke Beauchant aged 45 in 1911 in Cornwall England. Stephen was the son of Theophilus Samuel BEAUCHANT (1827-1864) Happy to share info. I am actually interested in the military career of Theophilus Samuel Beauchcamp, especially in his services during the War of 1812 in America. If you have any material (documents, diary, or anything that covers this period), I would be most interested to hear from you and I am interested to know if there are any pictures of this individual. I am a former museum curator and now retired and a free-lance writer and have written on the War of 1812. Therefore, any assistance will be very greatly appreciated and due credit given in my future writings in this area. Hi while looking into my family ancestry I found some information about Robert Michael Nowell-Usticke. My great great grandfather John Hocking purchased Robert Michael Nowell-Usticke’s estate in 1885 and we have paperwork with his signature and seals dated September 29 1885. Earlier in the thread you mentioned he had died childless in 1881. Very interesting, Julie. Thanks for sharing. Very interesting. I’d love to read it!